Want to instantly jump higher? Warm-up to a heavy single somewhere between 85% of your one rep max or greater. Rest a couple minutes. Then test your vertical jump. If you rested long enough, you surely jumped to new heights. This was due to a phenomenon called Post Activation Potentiation (PAP). This is another reason your second strength training set is usually your best set. In simplified terms, PAP is simply the waking and activation of a muscle. When a heavy load is lifted, there is increased neural drive to the muscle used. This leads to increased force potential and speed of activation for subsequent movements, provided that the optimal amount of rest is achieved. At some point, this increase in force potential will lose to fatigue. 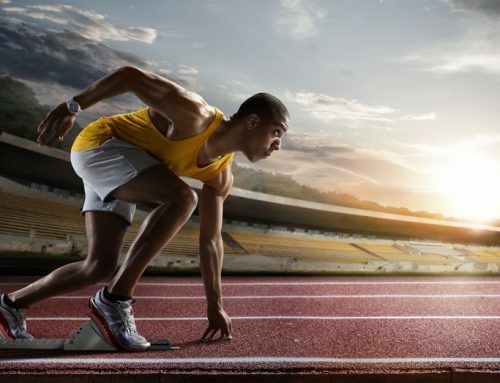 In order to take advantage of PAP, one must rest long enough to recover energy substrates and clear lactate, but not so long to lose neural drive. French Contrast Training is the fusion of both complex training and contrast training. This fusion is the ultimate weapon for transferring weight room performance to field performance. Here’s how to do it! 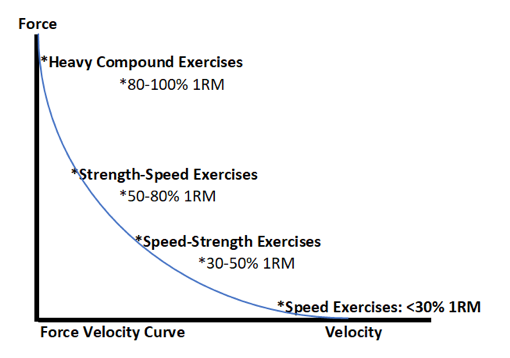 The complex training technique is defined as a heavy compound exercise paired with a higher velocity exercise of a similar movement pattern. The first exercise is used to enhance the muscle contraction potential of the second exercise (this is PAP), thus leading to more power generated. For the heavy compound exercise, choose loads of 85% of your 1-rep max or greater. Speed of contraction should either be as fast as possible concentrically or 3-second pauses isometrically. When wanting to incorporate loads greater than 100% (up to 120%), slower eccentric reps may be chosen. When training eccentrically or isometrically, keep the number of reps closer to 1 to manage fatigue and keep the time-under-tension low. Rest 15-30 seconds after the heavy compound exercise, then perform the high velocity exercise. High velocity choices are: plyometrics, Olympic lifts and Olympic derivatives, medicine ball throws, and compound patterns incorporating resistance bands, chains, and high-speed cables. Contrast training is typically performed by pairing a set of a heavy compound pattern with a set of the same pattern at a significantly reduced weight (called a drop set). The first set is typically loaded 85% or greater and the drop set is 70% or less. 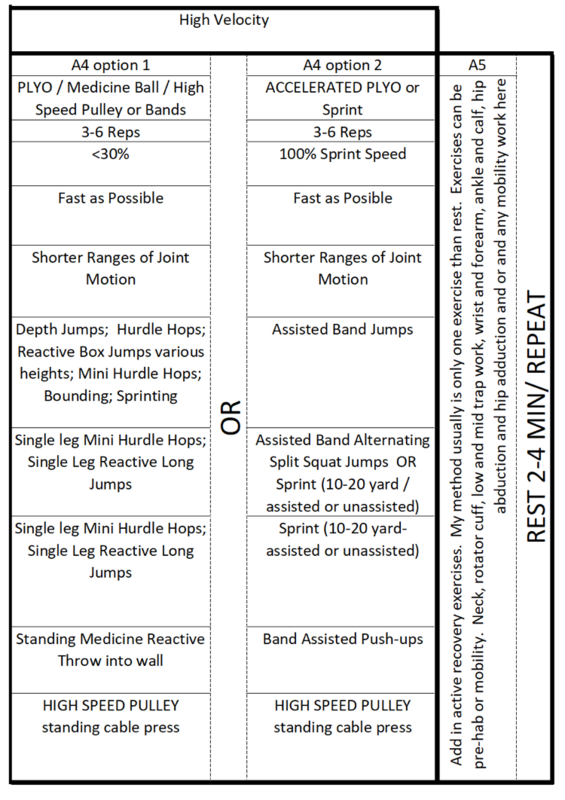 The key here is rest periods of 2-5 minutes to fully recover for the second set and to allow for maximal potentiation. If the rest was optimal, the weight will feel light and the lift will achieve a high velocity, thus improving the athletes rate of force development for sport. Reps are kept low as the goal is to maximize power. 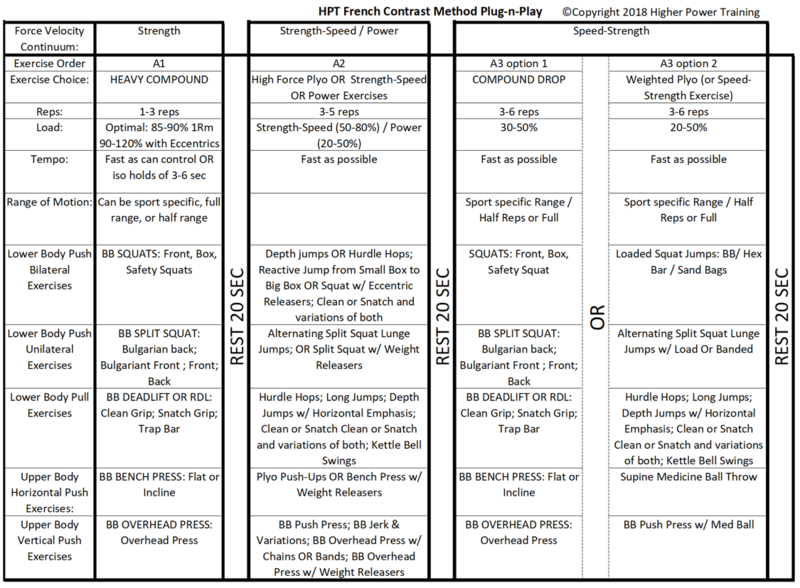 French contrast training combines the complex method with the contrast method to maximize potentiation and transfer of training to the field. Four exercises are paired, each one working different points on the force velocity curve. Each point works a different point of compromise between force and velocity. Training different points on the curve leads to a summation of the training effect, thus leading to better performance on the field. A1) Perform 1-3 reps of a heavy compound exercise at 85%. Rest 20 seconds. 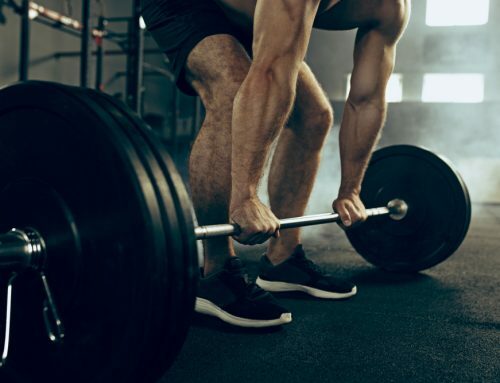 A2) Perform 3-6 reps of strength-speed exercises at 50-80% (plyometrics, medicine ball, Olympic lift and derivatives, compound movements that can be loaded with bands, chains, or high-speed cables). Rest 20 seconds. A3) Perform 3-6 reps of speed-strength exercises (Drop set at 30-50% or weighted plyometric at 20-50%). Rest 20 seconds. Since athletes require a rather long 3-5 minutes to recover after performing this series, maximize training economy by adding a fifth series of exercises focusing on training stabilizer muscles or prehab patterns. I always recommend performing a recovery movement for contrast/complex training, Trifecta training, or French contrast training. This is the exercise technique that come after the complex. In this case, it’s the A5 series. The chart below can be used to create your French Contrast Training program. Whether you want to run faster, jump higher, or just have faster cuts on the field, French Contrast Training is a training method that yields fast results.